The Udefrykte (also spelled Uderfrykte or Udyrfrykte) is the name given to a legendary troll. Only two trolls have been recorded in history to go by the name. They are the spawn of the Uderfrykte Matron, also known as the Horror of Dive Rock. The Umbra' Keth, or Shadow of Conflict, was an entity created by the War of Bend'r-mahk. The monster was sought by Jagar Tharn and Pergan Asuul for their own ends. 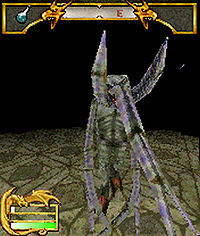 The creature was destroyed by the "Soul of Conflict", an unknown hero wielding the seven Star Teeth. A rare animal resembling a white horse with a single horn. 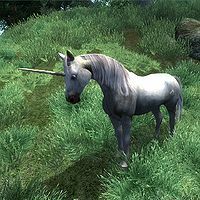 They are prey native to the Hunting Grounds, and are occasionally brought to Tamriel by Hircine. 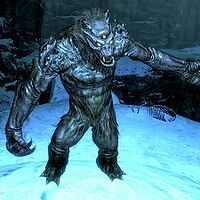 It will attack anyone who draws a weapon in its presence, and it can be harmed only by silver, Daedric, or enchanted weapons. Their horns are prized alchemical ingredients. This page was last modified on 2 December 2018, at 22:37.